I found this on the Electrical Engineering Stack Exchange and wanted to repost it here. A gentleman by the name of Olin Lanthrop originally wrote this as a guide to drawing legible, understandable schematics. I think everyone could benefit from reading this (whether you are experienced in drawing schematics or not). A schematic is a visual representation of a circuit. As such, its purpose is to communicate a circuit to someone else. A schematic in a special computer program for that purpose is also a machine-readable description of the circuit. This use is easy to judge in absolute terms. Either the proper formal rules for describing the circuit are followed and the circuit is correctly defined or it isn't. Since there are hard rules for that and the result can be judge by machine, this isn't the point of the discussion here. This discussion is about rules, guidelines, and suggestions for good schematics for the first purpose, which is to communicate a circuit to a human. Good and bad will be judged here in that context. Schematic programs generally plunk down part names and values based on a generic part definition. This means they often end up in inconvenient places in the schematic when other parts are placed nearby. Fix it. That's part of the job of drawing a schematic. Some schematic capture programs make this easier than others. In Eagle for example, unfortunately there can only be one symbol for a part. Some parts are commonly placed in different orientations, horizontal and vertical in the case of resistors for example. Diodes can be placed in at least 4 orientations since they have direction too. The placement of text around a part, like the component designator and value, probably won't work in other orientations than it was originally drawn in. If you rotate a stock part, move the text around afterwards so that it is easily readable, clearly belongs to that part, and doesn't collide with other parts of the drawing. 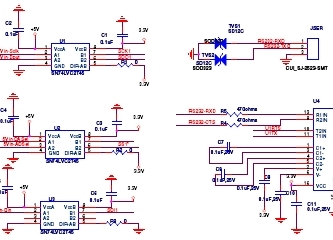 Vertical text looks stupid and makes the schematic hard to read. In general it is good to put higher voltages towards the top, lower voltages towards the bottom, and logical flow left to right. That's clearly not possible all the time, but at least a general higher level effort to do this will greatly illuminate the circuit to those reading your schematic. One noteable exception to this are feedback signals. By their very nature, they feed "back" from downstream to upstream, so they should be shown sending information opposite of the main flow. Show pins of ICs in position relevant to their function, NOT HOW THEY HAPPEN TO STICK OUT OF THE CHIP. Try to put positive power pins at top, negative power pins (usually grounds) at bottom, inputs at left, and outputs at right. Note that this fits with the general schematic layout as described above. Of course this isn't always reasonable and possible. General purpose parts like microcontrollers and FPGAs have pins that can be input and output depending on use and can even vary at run time. At least you can put the dedicated power and ground pins at top and bottom, and possibly group together any closely related pins with dedicated functions, like crystal driver connections. ICs with pins in physical pin order are difficult to understand. Some people use the excuse that this aids in debugging, but with a little thought you can see that's not true. When you want to look at something with a scope, which question is more common "I want to look at the clock, what pin is that?" or "I want to look at pin 5, what function is that?". In some rare cases you might want to go around a IC and look at all the pins, but the first question is by far more common. Spend some time with placement reducing wire crossings and the like. The recurring theme here is clarity. Of course drawing a direct connection line isn't always possible or reasonable. Obviously it can't be done with multiple sheets, and a messy ratsnest of wires is worse than a few carefully chosen "air wires". If a net is broken up into visually unconnected segments, then you absolutely have to let people know the two seemingly disconnected nets are really the same. Different packages have different built-in ways to show that. Use whatever works with the software you have, but in any case give the net a name and show that name at each separately drawn segment. Think of that as the lowest common demoninator or using "air wires" in a schematic. If your software supports it and you think it helps with clarity, by all means use little "jump point" markers or whatever. Sometimes these even give you the sheet and coordinates of one or more corresponding jump points. That's all great, but label any such net anyway. Use all caps for net names and pin names. Pin names are almost always shown upper case in datasheets and schematics. Various schematic programs, Eagle included, don't even allow for lower case names. One advantage of this, which is also helped when the names aren't too long, is that they stick out in regular text. If you do write real comments in the schematic, always write them in mixed case but make sure to upper case symbol names to make it clear they are symbol names and not part of your narrative. For example, "The input signal TEST1 goes high to turn on Q1, which resets the processor by driving MCLR low.". In this case it is obvious that TEST1, Q1, and MCLR refer to names in the schematic and aren't part of the words you are using in the description. Decoupling caps must by physically close to the part they are decoupling due to their purpose and basic physics. Show them that way. Sometimes I've seen schematics with a bunch of decoupling caps off in a corner. Of course these can be placed anywhere in the layout, but by placing them by their IC you at least show the intent of each cap. This makes it much easier to see that proper decoupling was at least thought about, more likely a mistake is caught in a design review, and more likely the cap actually ends up where intended when layout is done. Draw a dot at every junction. That's the convention. Don't be lazy. Any competent software will enforce this anyway, but surpringly we still see schematics without junction dots here occasionally. It's a rule. We don't care whether you think it's silly or not. That's how it's done. Sort of related, try to keep junctions to Ts not 4-way crosses. This isn't as hard a rule, but stuff happens. With two lines crossing, one vertical the other horizontal, the only way to know whether they are connected is whether the little junction dot is present. In past days when schematics were routinely photocopied or otherwise optically reproduced, junction dots could dissappear after a few generations, or could sometimes even appear at crosses when they weren't there originally. This is less important now that schematics are generally in a computer, but it's not a bad idea to be extra careful. The way to do that is to never have a 4-way junction. There is another human point to this too. 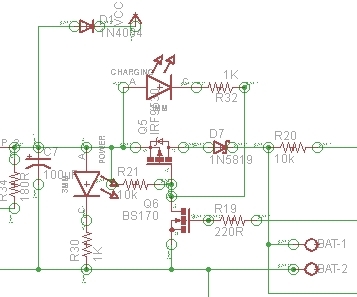 A sloppy schematic shows lack of attention to detail and is a irritation and insult to anyone you ask to look at it. Think about it. It says to others "Your aggrevation with this schematic isn't worth my time to clean it up" which is basically saying "I'm more important than you are". That's not a smart thing to say in many cases, like when you are asking for free help here, showing your schematic to a customer, teacher, etc. Neatness and presentation count. A lot. You are judged by your presentation quality every time you present something, whether you think that's how it should be or not. In most cases people won't bother to tell you either. They'll just go on to answer a different question, not look for some good points that might make the grade one notch higher, or hire someone else, etc. When you give someone a sloppy schematic (or any other sloppy work from you), the first thing they're going to think is "What a jerk". Everything else they think of you and your work will be colored by that initial impression. Don't be that loser.